Recently my husband and I took a trip to his home country of China. This was my first visit there, and naturally my interest in peonies extended to peonies in China as well. 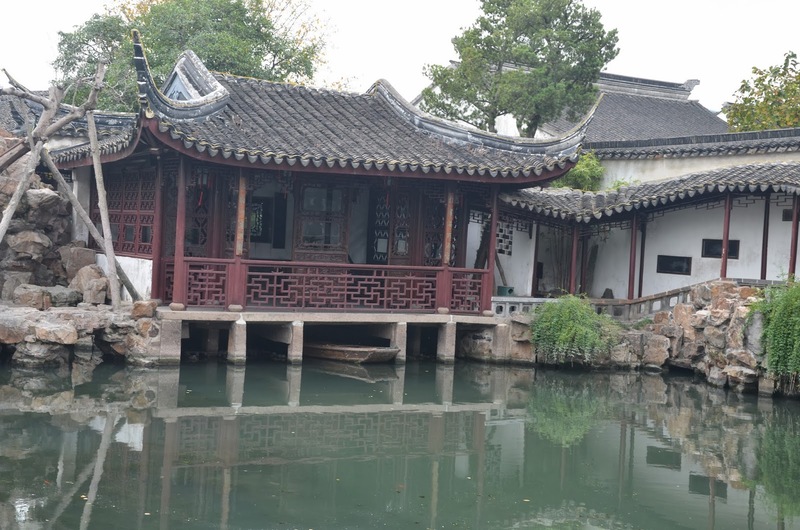 We took tours in several Chinese cities, and everywhere we went I looked for peonies. They weren't too hard to find! I found them in their palaces, gardens, temples, and botanical gardens! 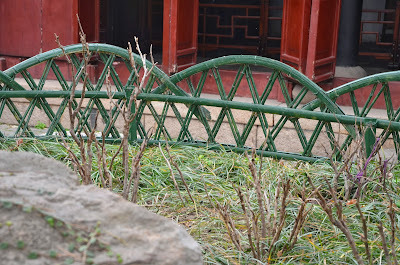 Even though it was late fall and most of the peonies were dormant, I still searched for their barren sticks, trying to gather any information about Chinese peony cultivation that I could. Over 95% of the peonies I found were tree peonies. There were very few herbaceous peonies to be found. The majority of the tree peonies I saw had already had their leaves removed from their stems. Also the dirt was mounded around the base of the tree peonies stems. I'm not sure if that was in preparation for winter or if they leave it this way all year round. There was no mulch on any of their tree peonies. They were all grown in soil that appeared to have been heavily and continuously cultivated. The soil was never flat or smooth. It was always uneven, like mounded globs of dirt and soil all around the peonies. 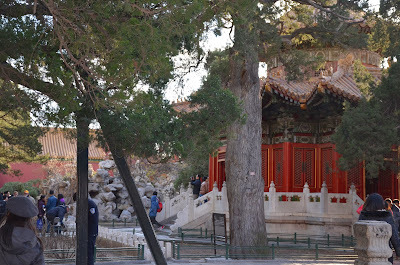 The first place I encountered peonies in China was at the Forbidden City in Beijing, China. The Forbidden City served as the imperial palace in China for almost 500 years. The peonies there were grown in an outdoor garden, almost like a courtyard. They were growing in partial shade through the filtered sunlight nearly underneath a canopy of mature evergreen trees. These tree peonies had already been defoliated and were growing in an unmulched, cultivated bed surrounded by stone walkways and very low concrete and metal fences for protection. The next location I happened upon peonies during my trip to China was in the Master of the Nets Garden in Suzhou, China. 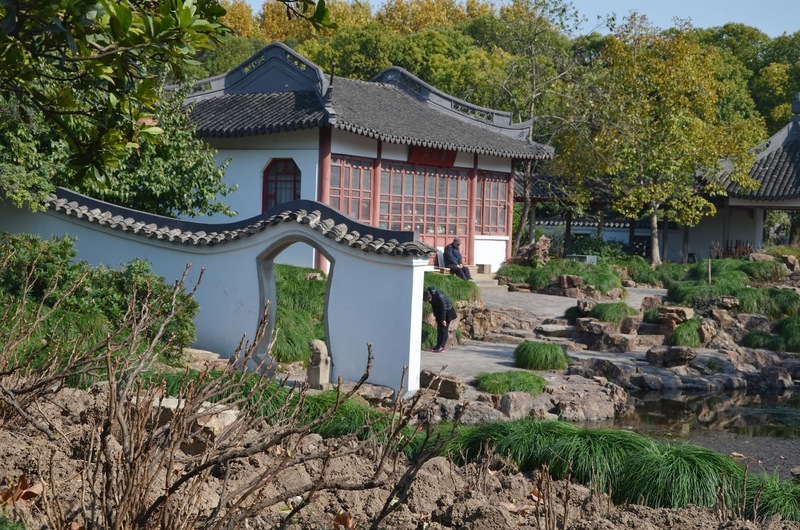 The Master of the Nets Garden is one of the 9 classical gardens in Suzhou recognized as a UNESCO World Heritage Site. The peonies here were grown in a small cultivated bed next to the central pond of the garden. 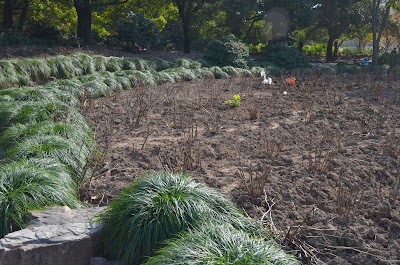 The bed also contained a mature pine tree that created some filtered shade for the peony plants. Underneath the peonies grew a type of evergreen grass-like perennial, similar to mondo grass. 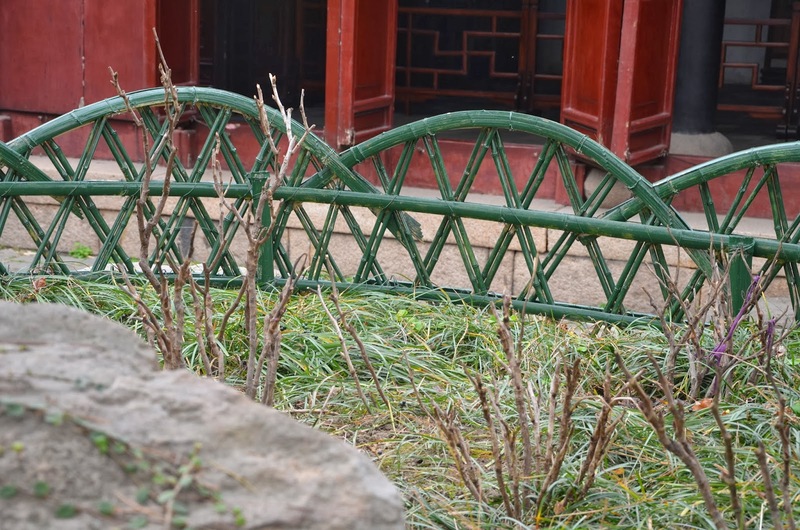 These tree peonies had also been defoliated and grew inside the bed surrounded by a low, curved bamboo fence that had been painted green. "Only in the sun of civilization can trees maintain evergreen." The third place I encountered peonies in China was at the Longhua Temple in Shanghai, China. 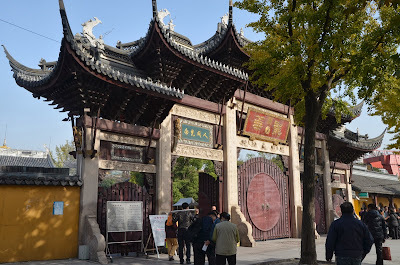 The Longhua Temple is a Buddhist temple in Shanghai where my husband and his relatives were visiting the Buddhas. I found the peony garden near the back of the temple complex. The peonies there were grown in globular cultivated soil surrounded by a decorative low concrete wall. 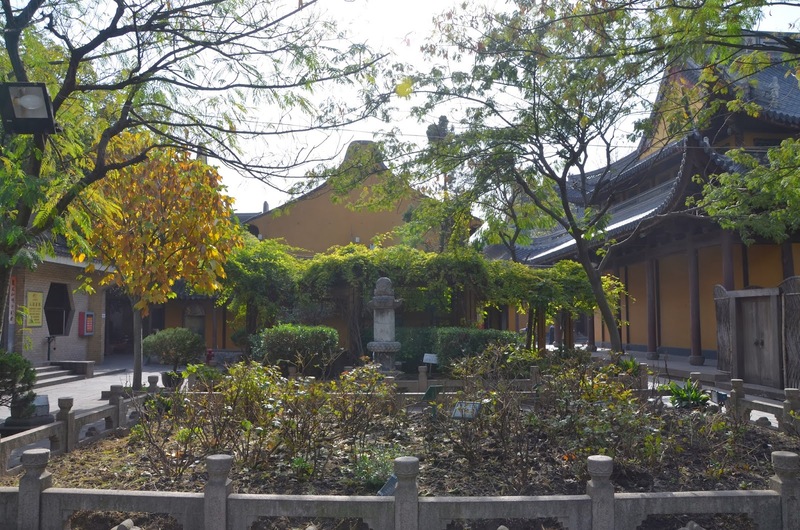 The garden was surrounded on three sides by temple buildings and stone walkways. 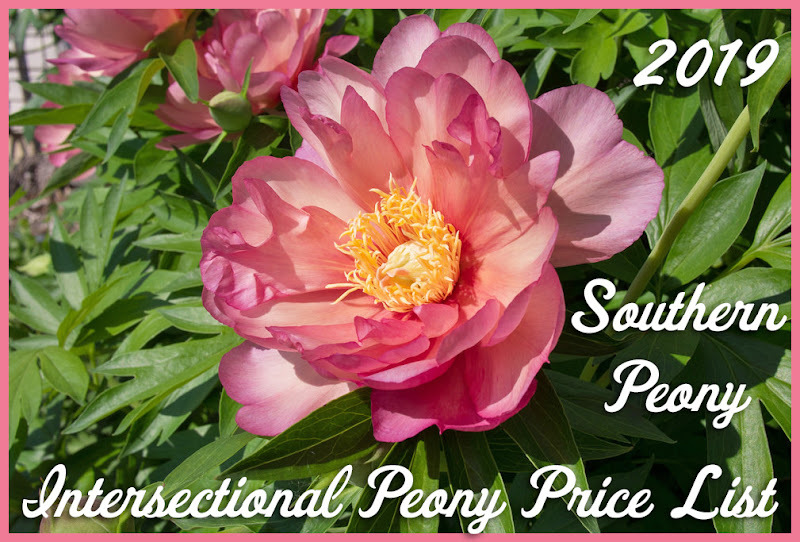 Four herbaceous trees were grown in the courtyard surrounding each of the four corners of the peony garden, creating a canopy of filtered shade over the peonies. 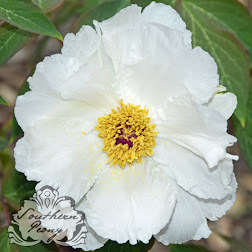 This was the first peony garden I found that contained herbaceous peonies as well as tree peonies, though the tree peonies vastly outnumbered the herbaceous ones. This was also the first peonies garden I'd encountered where the tree peonies has not yet been defoliated. The herbaceous peonies also had not yet been cut back. A few of the peonies still has some green foliage, although their season was nearing the end since their growing climate is similar to my own. 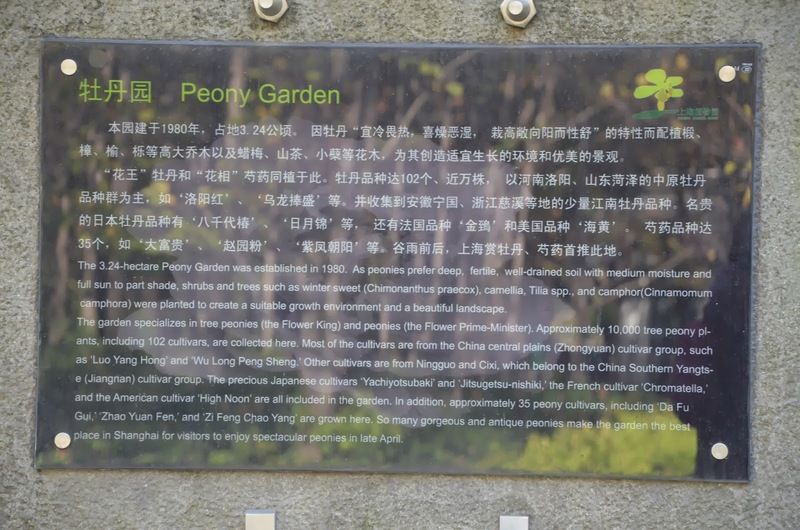 "The 3.24-hectare Peony Garden was established in 1980. As peonies prefer deep, fertile, well-drained soil with medium moisture and full sun to part shade, shrubs and trees such as winter sweet (Chimonanthus praecox), camellia, Tilia spp., and camphor (Cinnamomum camphora) were planted to create a suitable growth environment and a beautiful landscape. The garden specializes in tree peonies (the Flower King) and peonies (the Flower Prime-Minister). 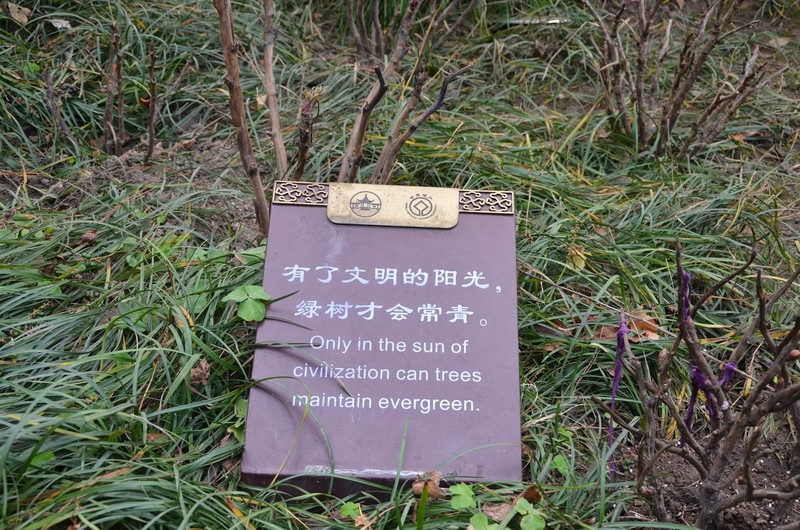 Approximately 10,000 tree peony plants, including 102 cultivars, are collected here. Most of the cultivars are from the China central plains (Zhongyuan) cultivar group, such as 'Luo Yang Hong' and 'Wu Long Peon Sheng.' 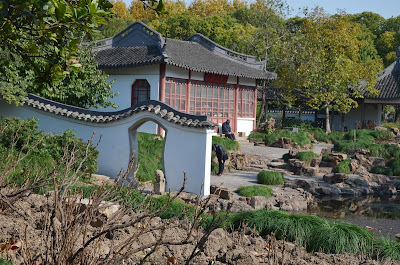 Other cultivars are from Ningguo and Cixi, which belong to the China Southern Yangtse (Jiangnan) cultivar group. The precious Japanese cultivars 'Yachiyotsubaki' and 'Jitsugetsu-nishiki', the French cultivar 'Chromatella', and the American cultivar 'High Noon' are all included in the garden. In addition, approximately 35 peony cultivars, including 'Da Fu Gui', 'Zhao Yuan Feng', and 'Zi Feng Chao Yang' are grown here. 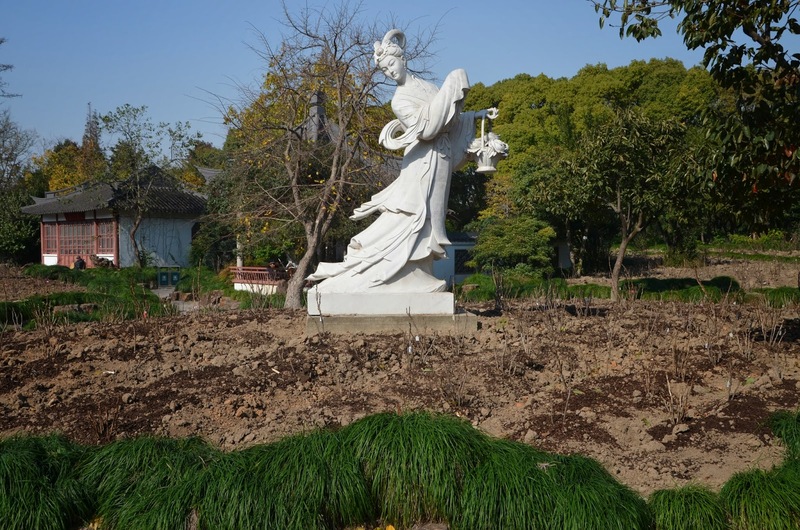 So many gorgeous and antique peonies make the garden the best place in Shanghai for visitors to enjoy spectacular peonies in late April." 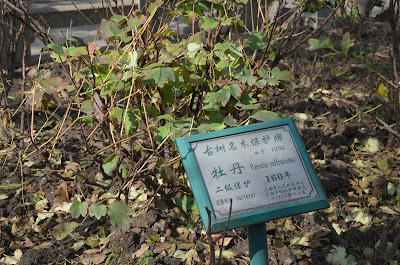 The last place I encountered peonies was during a planned visit to the Shanghai Botanical Garden in Shanghai, China. Although I had been happy to see what peonies I'd seen in China thus far, when I finally arrived to the peony garden inside the Shanghai Botanical Garden, I sorely wished it were spring!!! There were more tree peonies in their peony garden than I had ever seen in my life! 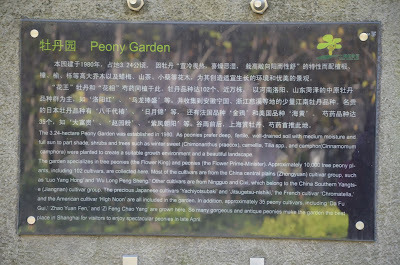 The sign at the entrance to their peony garden claimed "10,000 tree peony plants, including 102 cultivars." 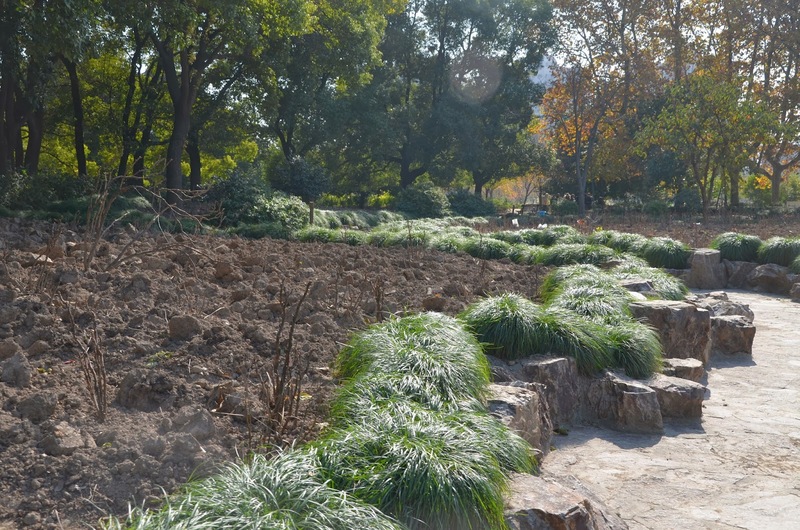 What a site this garden must be to behold in springtime! I believe that some Chinese tree peonies can exceed 10ft in height because some of the ones I have now have stems starting out at 3/4 inch in diameter with massive buds which means they have the foundation to support a lot of top growth. I wonder how big they can get in your climate. Yes, I have heard of ancient Chinese peonies before living for a hundred or hundreds of years. However I have not seen one in person. That would be quite a site. 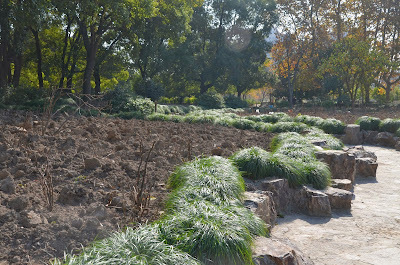 Yes, I am curious to see how the Chinese tree peonies will grow here too. I'll keep you posted!